As part of its “Feature” series of exhibitions, Galerie m Bochum is showing from July 17 to September 16, 2015, two painting installations titled “La mar” by the Spanish artist Paco Fernandez (b. 1950 in San Juan de la Arena). Paco Fernandez’s studio/home in Gijón (Asturias), on the Bay of Biscay, is located close to the coast, where he takes regular walks. A deep personal connection with this seaside landscape is often expressed in his work, for example in the series “La mar”. The artist’s fondness for the color blue, already evident in earlier works, is manifested in one of the installations on view in a broad range of nuanced shades. The mostly placid horizontal brushwork reinforces associations with the depths of the sea and the expanse of the sky. The images exude a congenial and harmonious atmosphere. 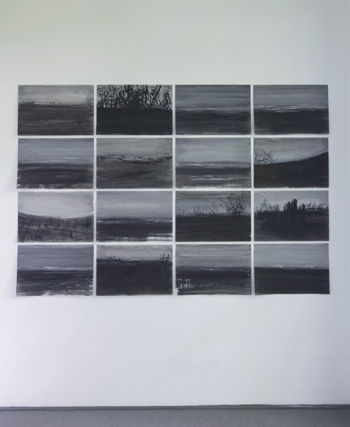 A wholly different mood emanates from the second series with its somber gray and black tones. Light and dark collide here, the color scheme evoking cloudy and stormy days at sea. The horizontal brushstrokes are interrupted by rising lines, sporadic dots of paint and amorphous structures that dissolve in the more or less tranquil flow of darkness, the whole resembling agitated, splashing water. Rather than merely depicting what he sees, Fernandez follows his intuition, conveying his own personal impressions and moods in spontaneously applied brushstrokes. Seen individually, these pictures appeal directly and authentically to the viewer’s emotions. Their strict serial arrangement within a grid, however, takes them beyond the motif of the sea to expand the horizons of our perception. Working together, the pictorial elements develop a rhythm all their own. 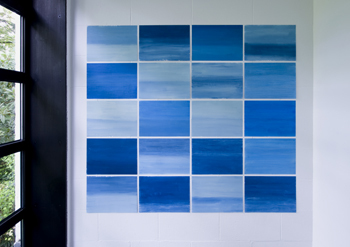 While each image can be seen as a variation on a seascape, the overall installation constitutes a composition of different tones within a specific color spectrum, pointing beyond the underlying subject.